My fruit tree initiation began at Scenic Nursery in Modesto, California where the owner, Jim Rogers, insisted that no bareroot fruit tree leave the nursery without a prune that took off the top two-thirds of the little tree. I knew Jim. I was sure he was right, but that didn’t mean I could do it. I left this daunting task to other workers in the nursery. Then one day, Ed Laivo, the sales rep and backyard fruit specialist from Dave Wilson Nursery, arrived at Scenic with some samples of tree-ripe Arctic Glo nectarines. I had never tasted any fruit more perfectly delicious. The following January I cut short a sapling, witnessed the consequences, and began my career as a fruit tree enthusiast and emphatic pruner. I’ve promoted the idea of using pruning to create small scale trees with an evangelical zeal ever since. 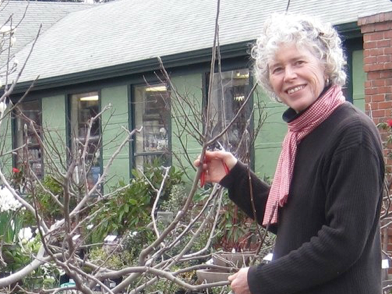 Some of you know me from our over-the-counter conversations at Berkeley Horticultural Nursery where I taught pruning classes and managed the fruit tree department. My book, Grow a Little Fruit Tree, is available at your local independent bookstore or wherever books are sold.